(Denver, CO) – Millions of young athletes experience a scary and potentially dangerous breathing disorder known as exercise-induced laryngeal obstruction (EILO). EILO, commonly misdiagnosed as asthma, is unresponsive to asthma medications. So doctors at National Jewish Health have developed new breathing techniques that are helping athletes control their EILO symptoms, even during high-intensity exercise when they tend to be most severe. Dr. Olin developed the breathing exercises based on observations of patients’ airways during very intense exercise. 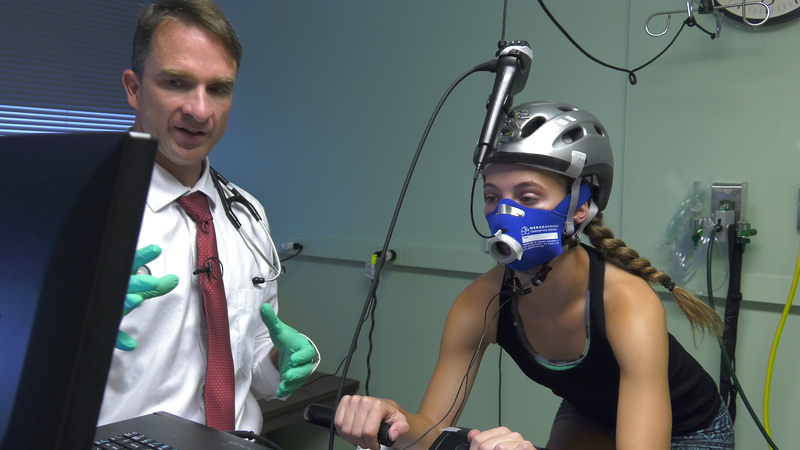 He asks patients to pedal as fast as they can on a stationary bike while a small camera in their throat captures images of their vocal cords. In those with EILO, their vocal cords tighten and close the top of the airway, causing noisy, labored breathing. Patients spend several sessions learning to perform the techniques step-by-step. By mastering them, athletes are able to use these techniques when EILO symptoms strike, even if they’re out of breath and may be panicked. Dr. Olin says that’s what makes the new breathing techniques so helpful when traditional EILO exercises fall short. Tod Olin, MD, evaluates a patient for exercise-induced laryngeal obstruction (EILO) at National Jewish Health. 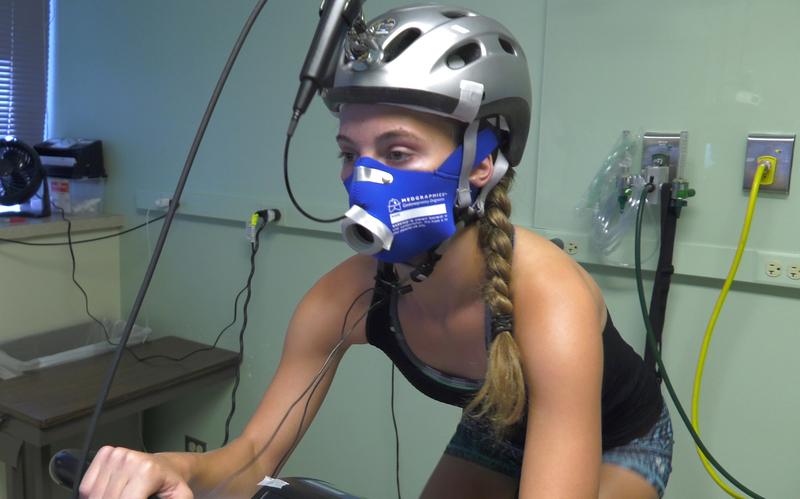 He developed new breathing techniques that have been shown to help two-thirds of patients control their EILO symptoms during high-intensity exercise. Alexis Beggar, 16, is tested for exercise-induced laryngeal obstruction (EILO) at National Jewish Health. Patients are asked to pedal as fast as they can on an exercise bike while a small camera down their throat observes the vocal cords. In those with EILO, the vocal cords tighten and close the airway, causing noisy and labored breathing. Tod Olin, MD, teaches breathing exercises to Alexis Beggar, who suffers from exercise-induced laryngeal obstruction (EILO). 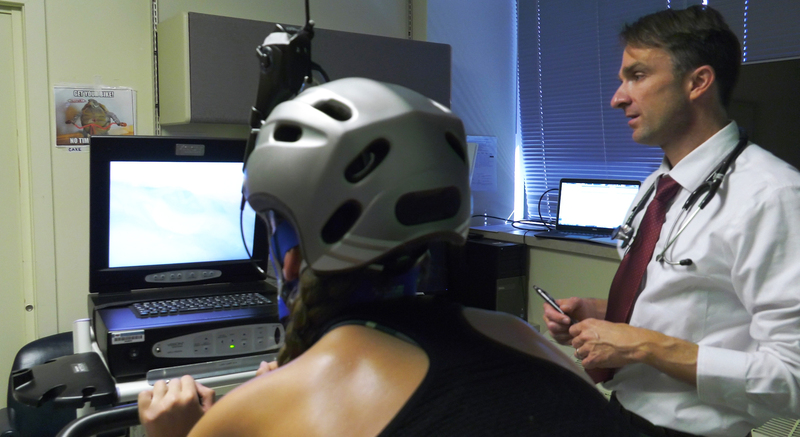 Dr. Olin developed the new breathing techniques to help athletes keep their throats open and breathe more easily while exercising.